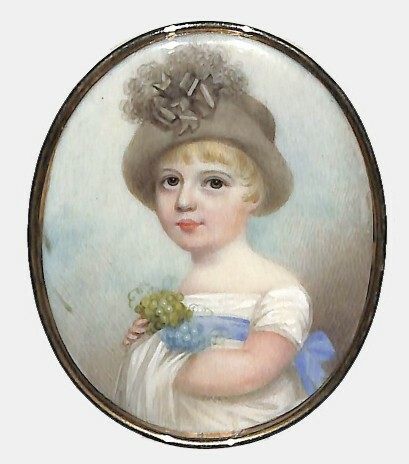 This is a charming portrait of a little boy named Charles Crespigny Vivian depicted at the young age of seventeen months wearing a white patterned dress wide on the shoulders and tied at the waist with a blue sash ribbon together with a delightful grey hat topped with a large ribbon rosette. In his chubby arms he holds two bunches of grapes. Charles was born on Christmas Eve 1808, the eldest son of Richard Hussey Vivian, 1st Baron Vivian and Eliza Champion de Crespigny. Following a career in the army, Charles become a Whig politician and MP for Bodmin until 1842 when he succeeded his father to become 2nd Baron Vivian and entered the House of Lords. He also served as Lord Lieutenant of Cornwall between 1856 and 1877. Lord Vivian married Arabella, daughter of Reverend John Middleton Scott, in 1833. She died in January 1837. Lord Vivian remained a widower until his death in April 1886, aged 77. He was succeeded in the barony by his son, Hussey, who became a prominent diplomat. Frame: Watercolour on ivory residing in the original gold frame, the reverse engraved with the sitter’s details – ‘Charles Crespigny Vivian / Born Dec. 24th 1808 / Aged 1 Year and 5 Months’. The frame lacks a hanging ring as the portrait was originally mounted within a giltwood frame with other family miniatures. Recent research suggests that Nicholas Freese was born in Birmingham, subsequently moving to London where he worked and exhibited until 1814. The recognised stylistic traits of his painting include almond-shaped eyes and bow lips both evident in this accomplished portrait.